I also recall reading Jennifer Berry’s article in the June 2015 Bee Culture Magazine (page 41), titled “OXALIC ACID: EFFECTIVE & EASY ON BEES, BUT . . .” Somehow at the time, I still had not much interest in considering even trying oxalic acid as a treatment. I must have been too pre-occupied with spring. Or, sometimes, I think I am just slow or stubborn or depressed when it comes to thinking about mite treatments. After all, I have tried so many of the authorized treatments-nearly all at some point. C2H2O4 (where c = carbon, h = hydrogen, o = oxygen). Here’s what I now know. Oxalic Acid (OA) is an odorless white solid, and colorless liquid. Its an organic compound found naturally in varying degrees in plants, animals, as well as in humans. OA combines readily with calcium. It is produced in our bodies as part of the metabolic processes of glyoxylic acid (from glucose) or ascorbic acid (think vitamin C). Organic oxalic acid is essential to stimulate peristaltic or smooth muscle (intestinal) motion in our bodies. In other words, it is needed to assist in the contractual movement to push along the foods and material that pass through our digestive system. What doesn’t get absorbed needs to be ‘pushed’ out. It can be a cause of kidney stones in humans. It has been fascinating to learn about OA as this compound is so prevalent in many of the foods we eat with especially high levels in like rhubarb, star fruit, black pepper, parsley, poppy seed, spinach, chard, beets, as well as in most nuts, berries, and beans. I mean that I’m sure I’ve heard of it before somewhere in my Biology, Zoology, Botany, Plant Geography or Human Anatomy & Physiology courses in college. But that has been a long time since those courses. I even learned that tea leaves contain OA. The highest measured concentrations are found in loose Black Tea with Black Tea in tea bags containing slightly less. The lowest concentrations are found in Japanese Green Tea. However, teas are found to be relatively low in OA concentrations compared to a food like raw spinach due to the small amount of leaves used for brewing. My mother drinks lots of tea, as do I. I can’t wait to inform her. The proposed use described two differing methods: (1) Solution and (2) Sublimation. You might ask but what is sublimation? The definition is the transition of a substance directly from the solid to the gas phase without passing through the intermediate liquid phase. In effect, since the OA crystals are not a liquid but a solid, they are sublimated. Although it’s very common to hear many people describe this process as vaporization, which by definition, it is not. I am committed to the sublimation method for various reasons, which you may find explained here by further reading. Mostly, it’s the least invasive for the bee colony, least time-consuming for me, and the most convenient, taking only several minutes to apply. OAS can be applied multiple times in rather short weekly successions, if necessary. In addition, It’s safe to apply when the beekeeper makes adequate safety precautions. The OA solution or drip method is recommended to be applied only once per year. After seeing the affects, it did not take much motivation to purchase a vaporizer too kit. The company I ordered it from, Bedillion Honey Farms, processed the on-line order quickly, had it shipped via USPS the next day, arriving within 48 hours. I even tracked the package by text until delivery. I chose their vaporizer model as it came with an on/off switch, and the promise of quick delivery. It wasn’t clear to me at the time, but they also included a 12oz container of OA crystals labeled as “Wood Bleach”. I had gone to 5 different hardware type stores before I located some. It was not available at big-box Home Depot or Lowe’s, although it appears they have it when searching for the product on-line. Brushy Mountain is the official bee supply company to sell the OA kits, but only currently as-of January 19, 2016 offers a kit to apply via the solution method. They have been authorized by the EPA to be the sole distributor of OA with an EPA label as a miticide to be used in bee hives. I had spoken to a representative in person at the Mother Earth News Fair in Topeka, KS in October. He contended that the OA sold as Wood Bleach is not 100% pure. It was difficult to understand his reasoning but I could tell he was dismayed, and moved on from the subject of OA. So, At this time, I’ve only been able to find in my research that the impurities in the commercial grade of OA are mostly iron salts, and that these would stay behind in the vaporizer pan. According to the research, there is no need to worry about these impurities, or salts. These impurities can be seen, if at all, as small residues of ash in the vaporizer pan. The pan or heating element is cleaned after each use when dunking into water to cool, before moving on to the next colony. The Savogran brand of wood bleach, which is the only brand I have found locally, is touted to be 95-100% pure OA. However, Brushy Mountain’s FAQs page states: “Versions of Oxalic Acid can be found in hardware stores but those have various additives mixed with them that can cause issue with the bees. Also it is illegal to use them for hives.” The representative at the MEN fair did not mention any particular brand. Another FAQ source to review is Dadant OxalicAcidVaporizer Q&A sheet. Both of these offer excellent guidelines and information. Wood Bleach This powdered formula wood bleach contains oxalic acid which, when mixed with hot water, effectively bleaches unfinished or stripped wood quickly and easily. It is excellent for removing black water spots and tannin stains in wood. Use on all unfinished woodwork, floors, doors and more to lighten wood or match different wood colors. You will need to decide for yourself. OAV is currently my mite treatment of choice, which appears to be the most effective against the varroa mite, and causes the least damage to bees with no contamination or lingering residue. As-of mid-January 2016, Arkansas, Iowa, Kansas, Missouri, Oklahoma, and Texas are the regional states in our area that have approved OA treatment for honey bees. We are still waiting for Nebraska and the Dakota’s as well as 11 other states. Even Kentucky, where my sister lives, has approved OA as a treatment method. OA can be purchased in bulk from chemical supply houses on-line or locally. Be sure that you are utilizing Oxalic Acid Dihydrate, and not any other form. I use an N95 mask, holding my breath at times, and staying up-wind from the vapors. It’s recommended to use a lit bee smoker to gauge and monitor the wind direction. However, I have found the risk of OAV not to be too dangerous, if precautions are followed. I also have shop goggles to wear just in case, but do not wear these most of the time. If you mishandle this product, there is the potential for personal injury. The mask is inexpensive. Depending on the wind, I will be prepared to get away. I turn on the switch, set my timer (iPhone comes in very hand for this) for 3 minutes, insert the vaporizer, close the hive with a towel, and wait. When the minutes are up, I remove the heating element, insert it into a cup of water for cooling. I keep the the hive entrance covered for another 10 minutes, waiting for the crystals in the hive cool, re-condensing on the interior of the hive as they cool, and re-condensing on the bees themselves. I put together my own kit that includes all the equipment I need but the power source, including gloves-when perhaps needed. 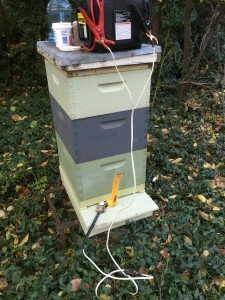 I am able to easily take this kit with me, moving from hive to hive within the bee yard, until all colonies have been treated. It’s the most optimistic I have been in dealing with mites, and honey bee colonies in 20 years of beekeeping and dealing with mites. So far, I am only seeing the OAS is the best form of current treatments. I wonder about this, and can only question, “What took so long for me to figure this out?” Nicholas Aliano and Dr. Marion Ellis had done several studies with oxalic acid in 2008 and 2009 at the University of Nebraska. However, just to note, as a reminder, this treatment was only just approved in March of 2015. I’m so enthusiastic and delighted that I finally tried this method! I’ve shared this treatment with many other beekeepers now. The results we have seen are amazing. OAS treatments are best done during near brood-less times in the fall as only mites on the bees – not the ones in capped cells on pupae are killed. So, October and November worked out very well for me. Following-up, the recommended subsequent treatments are 7 days later, and then another 14 days after that to get the mite population down to a minimal amount. I use a charged power-pack to take to the field with me as a power supply. I began my treatments in early October, and completed the follow-up treatments in a timely fashion. Colonies are looking really good. My worries about mites are still present, but greatly alleviated. Honey supers, if on the colony, have to be removed or blocked ***UPDATE August 25, 2016: Article from American Bee Journal, September 2016, “Keeping Honey Bee Colonies Safe From The Varroa Mite” by Meghan Milbrath, Ph.D., chart on page 989 shows that OA can be used with honey supers on. 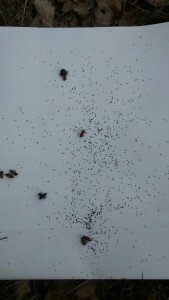 Nearly a month into winter in January, and I have such optimism for my bees and their future. My experiences so far have only been positive. Bottom line is that fewer mites should result in healthier colony, and longer-living bees, and more bees for better winter survival with less dwindling populations and even feeding. Stronger, healthier colonies simply do better. And this was my happy accidental discovery from 2015. However you decide, use this treatment at your own risk. As an update, a friend provided me with a link to the March 2016 Bee Culture article. I am providing it here for your reading pleasure. This entry was posted in Mite Treatment and tagged Mite Control, OAV, Organic Mite Treatment, Oxalic Acid Vaporization by Robert. Bookmark the permalink. Wow! Thank you for sharing your experience. My father has cultivated bees on his pasture for years but lately he has been struggling with keeping a majority alive when winter comes. We’ll defiantly look into using Oxalic acid vaporizer to protect the bees from mites. It’s interesting to read about what oxalic acid actually is and how it works. I didn’t know OA was in a lot of the foods we eat and that the sublimation method can be helpful for outdoor colonies. This could be helpful to talk to my brother about because knowing how it works could make it much easier for him to know what’s happening and why it might help. Robert, I just came across this article that you wrote. I would caution you using the N-95 mask. It is not designed for use for protection from vapor/acids. It is a biologic mask that will prevent 95% of airborn or particulate liquids with biologics (think coughing/sneezing) that is most commonly used in hospital, or doctor office settings. Dear John: Thanks for your comment about my article and the reference to using the N-95 mask. Several sources, including Dadant Bee Supply, reference that the N95 mask is sufficient per EU Standards to use. While I realize that we are not the EU, the testing and usage of OA Sublimation and approval by the EPA were done based on the usage and testing in the EU. I have used the N95 mask for the last 4 seasons, and feel safe in that I will continue to use it. Thank you again for your comment and contribution. Here’s what is available about the mask: The “95” in N95 refers to the filter efficiency. There are three levels of filter efficiencies – 95% (N95), 99% (N99), and 99.97% (N100 or HEPA filter) tested against aerosol (fine mist) droplets 0.3 microns in diameter. N95 type respirators are the respirators recommended by the Government of Canada and the U.S. Centers for Disease Control and Prevention (CDC) for use by health care workers in contact with patients with infections that are transmitted from inhaling airborne droplets (e.g., tuberculosis (TB); also recommended for health care staff working with patients having or suspected of having SARS, severe acute respiratory syndrome).